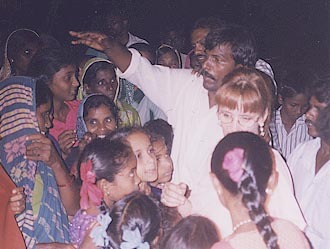 This was the first evening of a three-day crusade in the village of Emani. It is a thatched-hut village about eight kilometers from Tenali. The road connecting Emani is straight for the most part lined by canals on either side. You would see women washing clothes, children swimming, people washing their buffalos and all sorts of activities unfolding as you go along the long stretch. I was amazed to see that women actually pound the cloths against the rocks to wash them.I have watched Sujatha do this very thing, but only on a corrugated walkway over a trench that runs on either side of the street. Life is still so primitive there, yet life thrives unabated. The really amazing thing for me was the attitude of the people. They had nothing of value, but valued everything. It is often the opposite here in America. Look at the happy faces of these children. They have no Play Stations or Barbie dolls. Im not carrying a sack of presents on my back, not even food or water to offer them. They are so excited because a Friend of Jesus was going to pray for them and bless them! If they only knew what a Blessing they were to me. What an honor for me, to be known as a friend of Jesus wherever I went. The Hindus believe that Jesus is a God and has the power to heal and to Bless, but they believe he is only one of thirty-six millions of gods and goddesses. This picture was actually taken at around midnight, and we prayed for the children and the sick first. This particular crusade was a three-evening event. It was at this crusade that I encountered the first demonic manifestations. I had not looked for it, and certainly did not expect it, and if it were a matter of personal preference I would almost immediately leave that part out. Nevertheless, this is my story, just as it happened; the good, the bad and the evil, which I shall narrate to you truthfully. Every night people were slain in the spirit, healed of many illnesses, delivered of demons and saved, all by the Grace of God! By the third night there were more miracles than could be counted. Salvations, healings, and deliverances, all combinations, hundreds! What an awesome God we serve!